Friday, 25 January 2019. Even though Marzieh Hashemi has been released, join the worldwide demonstrations to protest US injustice. London supporters: Join the Global Call for Action by the Family of Marzieh Hashemi and Campaigners of Justice from around the world. For details of global protests visit #FreeMarziehHashemi. 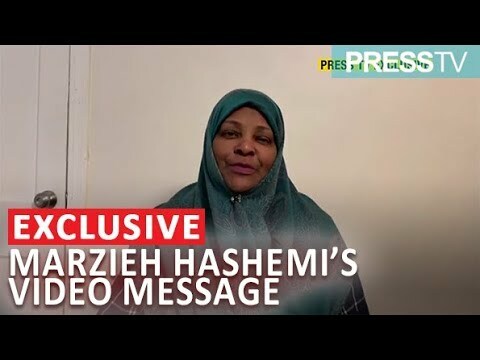 Marzieh is an African-American, Muslim Journalist who was arrested on January 13 and was being held without charge under a controversial “Material Witness” law in the United States. Although she was released on 23 January, she has called for the demonstrations today to go ahead in support of all those unjustly imprisoned in the US. In the initial days of her imprisonment, her hijab was taken off against her will, she was forced to take a mugshot without it on, and she was refused halal and vegetarian options, effectively denying her access to food. Join us to raise our voices against the mistreatment and detention of Marzieh Hashemi and the many other victims of the US incarceration and security regimes. Our team is preparing placards, materials, and chants.